Description: The Rush family (Juncaceae) is often confused with the Sedge family. Indeed the two types of plants are found in similar habitats. 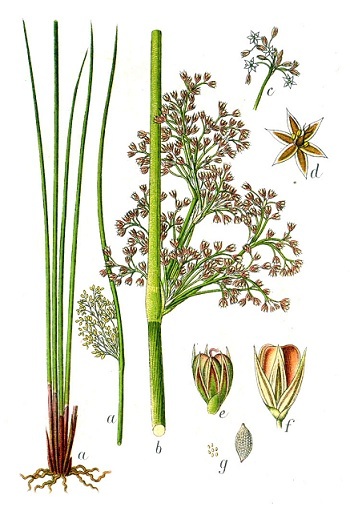 They are distinguished from the Sedge family in that their stems are round and their fruit contain three seeds, whereas all sedges have three-sided stems and their fruits contain only one seed. They are further distinct from grasses in that their leaves occur in sets of three, with a closed sheath. 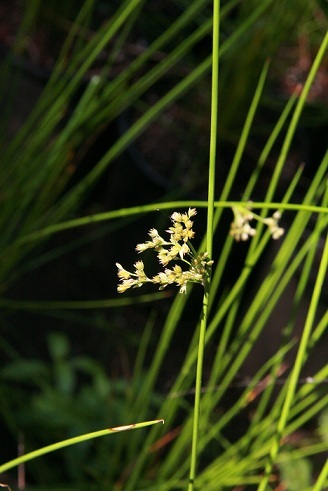 The leaves of grasses, on the other hand, grow in pairs and the sheath is open. 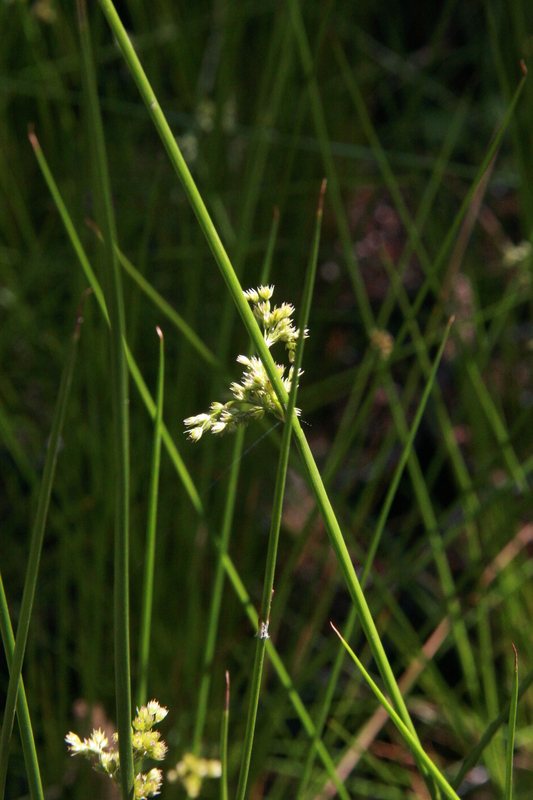 Of the rushes, Juncus effusus is thought to be the easiest to identify. In this plant, the leaves are nothing more than the closed sheath and look like small bristles along the stem. This is a very noticeable and distinct feature. The stems form thick clumps and are a rich brown at the base. Many flowers form in compact spikelets located between 1-2” from the top of the stem. They develop slowly in March and persist for many months, to September or even October. The tiny, light brown seeds are spread by water, the wind or are passed through animals’ digestive tracts. They can live for up to sixty years. As an interesting aside, the longevity of the seed may be offset by an alleopathic effect. Alleopathy occurs when a plant inhibits the germination, growth or amount of chlorophyll of other plants through root secretions or phytotoxins as an effect of the decaying plant material. 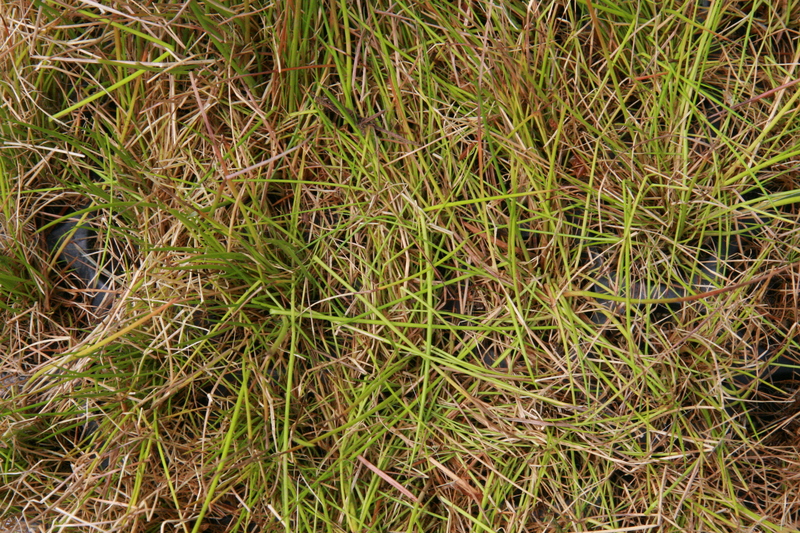 The seedlings of common rush actually find the decaying litter of adult plants very toxic and are therefore thinned out through this reaction. The abundance and longevity of the seed, the wide range of habitat, the ability to tolerate fluctuating water levels and highly polluted soils combine to make it an extremely hardy plant. In some areas, it has been known to become invasive. Yet in other areas, namely the state of New York, it is considered an endangered species and is protected by law. 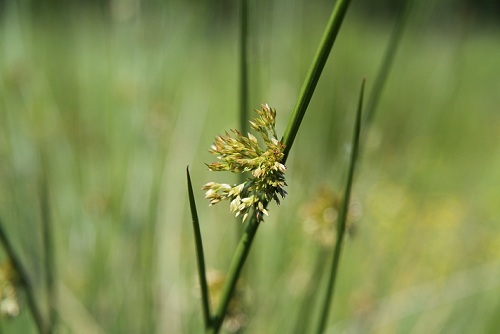 Common rush is a highly valuable plant for restoration and mitigation projects because it is so hardy and so adaptable. 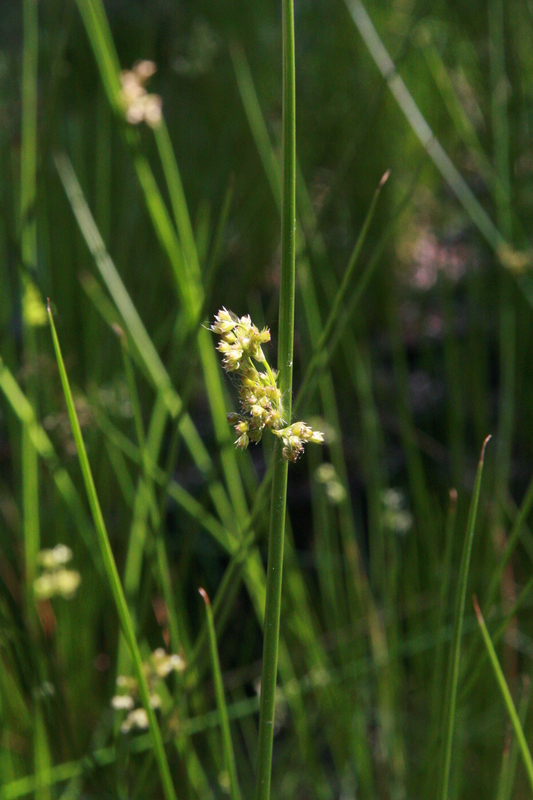 Habitat and Range: Common Rush is found in areas below 8,000’ elevation throughout most of North America and grows in freshwater wetlands from Alaska to Newfoundland and south to California. It grows in temperate regions of Europe and Asia. However, it is most commonly found in the eastern ranges of North America. It grows in many settings – wet ditches, the edges of streams and ponds, wet depressions in fields and in tidal zones. It occurs very frequently in disturbed sites. It is likely that disturbing the soil will awaken sleeping seeds that have been there for many years. 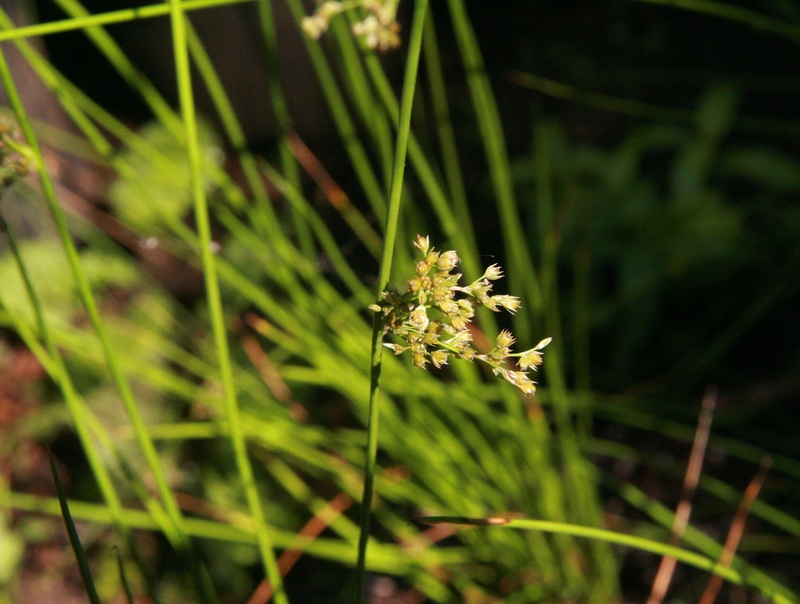 Native Plant Gardening/Wildlife Habitat: Common Rush is a valued food for a wide variety of birds. Muskrats use them for food and as nesting material. 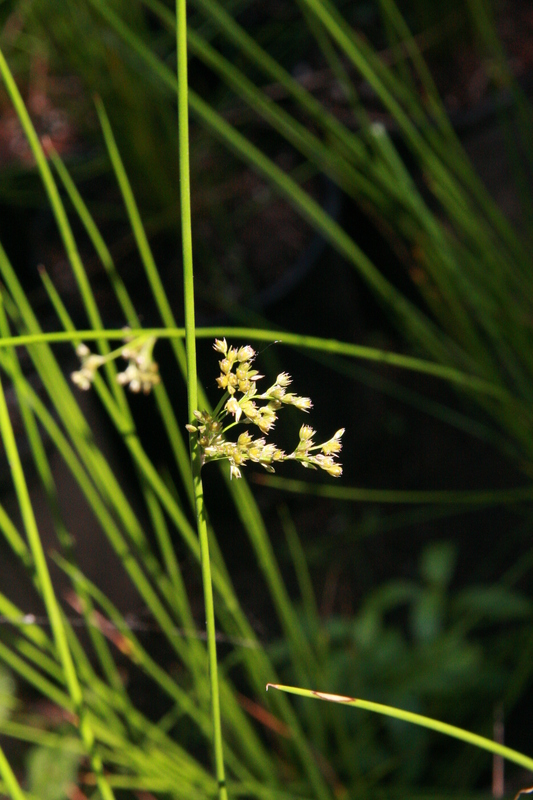 Ornamental Value: Common Rush is a fast-growing and extremely hardy plant. This plant makes a striking addition to a wet garden, an artificial or koi pond or as a border to conceal a drainage ditch, as it remains a vibrant green all year and retains its flowers for an extremely long time. Try interspersing it with larger, water-loving plants, such as members of the willow family (Salix spp.) or, if you want to attract birds, try Red Osier dogwood (Cornus sericea) or Serviceberry (Amelanchier spp.). Historical/Cultural uses: Native groups did not use Common Rush extensively, although they did prepare a decoction of the leaves for emetic purposes. It served as bedding and occasionally was used for weaving as well. Lastly, it was used to graze livestock where little else was available for browse. Some other uses for this plant include using the fibre from the stems for paper and soaking the partially peeled stems in oil and lighting on fire for a small light source. Propagation Techniques: The most successful means of propagating this plant are through bare rootstock. These delicate plants should be kept moist and cool until planting. When ready, bury them to their crowns in a moist, sunny spot where they can become somewhat established before the heaviest rains (late October to early November being ideal on the Pacific coast). Cronk, Julie and M. Siobhan Fennessy. 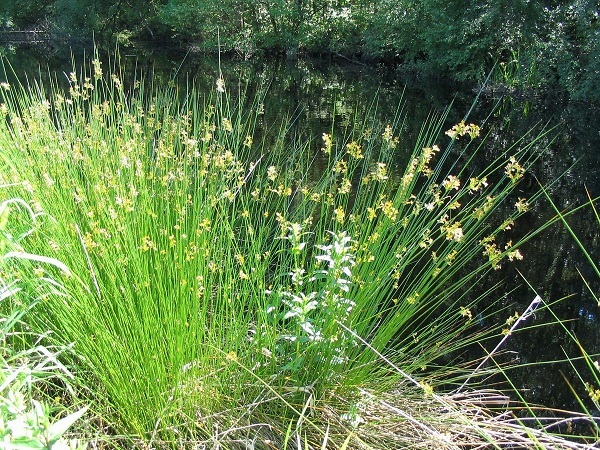 Wetland Plants: Biology and Ecology. New York: Lewis Publishers, 2001. Delesalle, Bruno in cooperation with Ducks Unlimited and Environment Canada. Understanding Wetlands: A Wetland Handbook for British Columbia’s Interior. BC, Canada: Ducks Unlimited Canada, 1998. Fassett, Norman. A Manual of Aquatic Plants. New York: McGraw Hill Inc., 1940. Hotchkiss, Neil. Common Marsh Plants of the United States and Canada. Washington, DC: Bureau of Sport Fisheries and Wildlife, 1970. Mohlenbrock, Robert. Sedges: Cyperus to Scleria. Illinois: Southern Illinois University Press, 1976. Thompson, G. and Coldrey, J. with photos by G. Bernard and illustrations by G. Thompson. The Pond. Toronto: William Collins Sons & Co. Ltd., 1984. Turner, Nancy. Ethnobotany of the Hesquiat Indians of Vancouver Island. Cultural Recovery Paper No. 2. Canada: British Columbia Provincial Museum, Province of British Columbia, Ministry of the Provincial Secretary and Government Services. 1982. Plants for a Future (September, 2001) http://www.comp.leeds.ac.uk/pfaf. Golden Gate National Parks, San Francisco, California, Nurseries Department United http://www.nativeplantnetwork.org/network. United States Department of Agriculture, Natural Resource Conservation Service (April, 2002) http://plants.usda.gov.